Time for a review! It’s the second one featuring clothes from Grace’s collection. You can read about her pajamas here. Grace is here to help me, of course! This is the whole outfit. We’ll start with the apron. It’s really cute and well made. 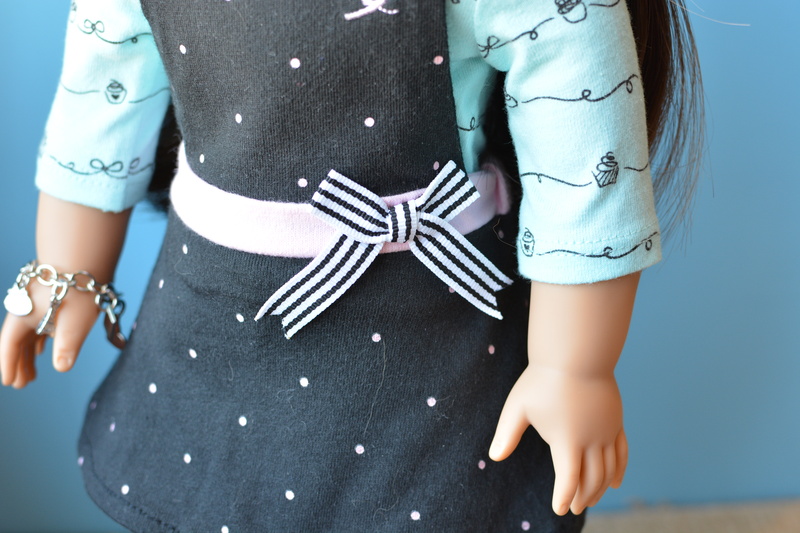 I like the striped bow on the side and dainty polka dots on the fabric (you know you have a pet cat when you find cat hair on your dolls’ clothes!). The apron is hard to get on and off though, because you have to slide it on, and then pull the straps over her head to attach them in the back. Taking it off messes up Grace’s hair. On the upper right corner is Grace’s signature heart. I think it adds a nice touch. 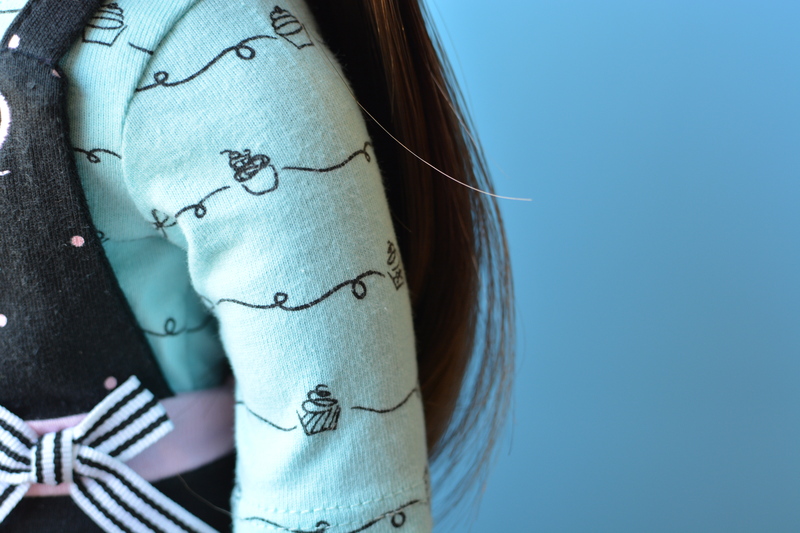 The cupcake shirt has little cupcakes, bows and swirls all over it. I like it a lot. It has mix and match potential. It has cheap, thin Velcro on the back though. The leggings are light pink and are really soft. The fabric is thinner than normal leggings, but not like tights. The pink color is the same as the dots on the apron. This is the tag on the leggings. 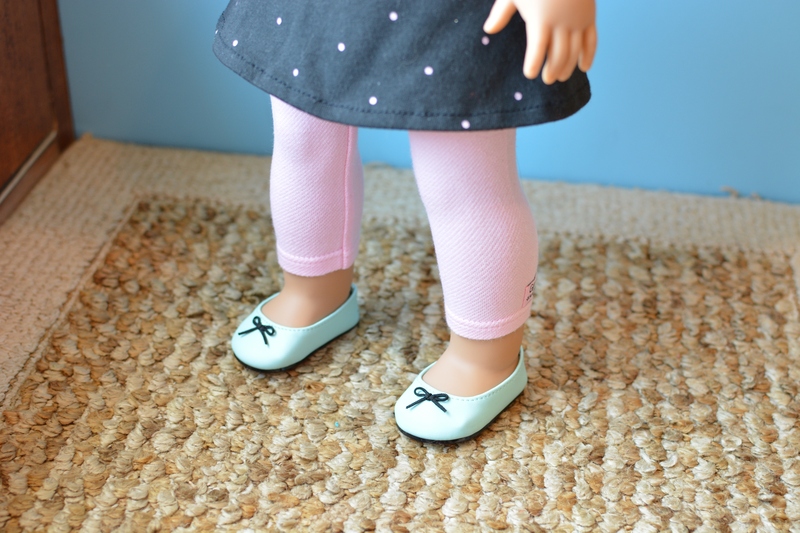 The shoes are the same color as the shirt and have a little black bow on each one. 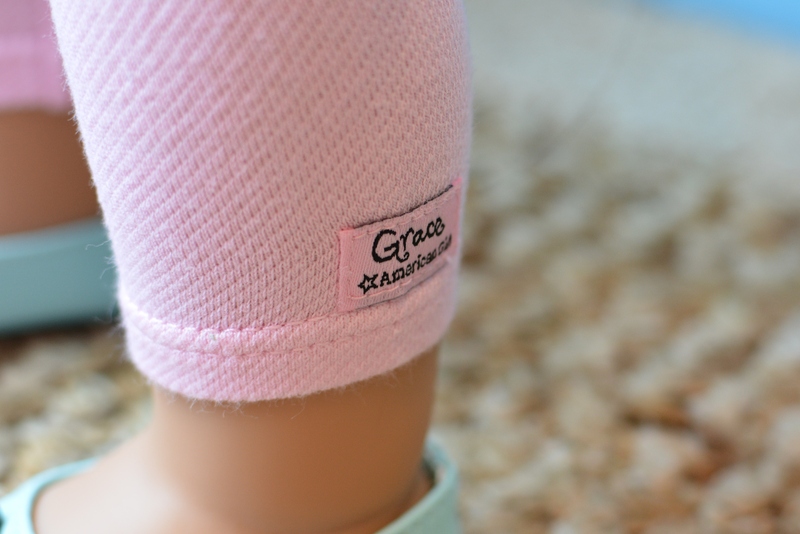 They have a lot of mix and match potential and can go with many of Grace’s outfits. The shoes are well made and fit fine. On the back of the apron is this design. I think it’s really cute and unique with the bows. 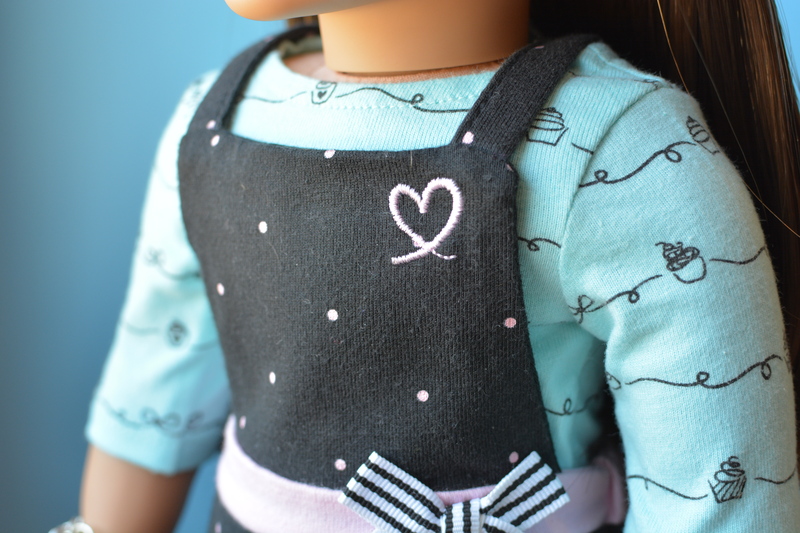 The straps attach to the apron with sturdy Velcro. How does it look without the apron? It doesn’t really look complete, like it should have a tunic or jacket with it. Good question! Thanks for answering! 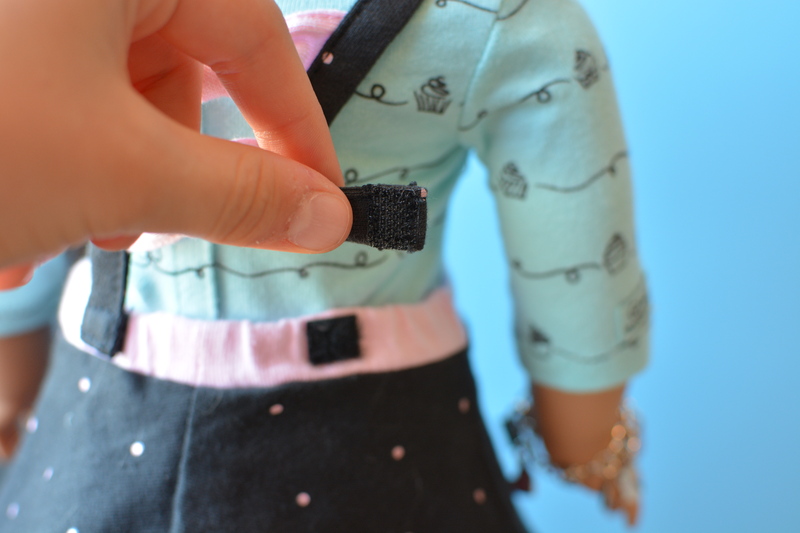 I wonder how it would look with different cardigans and jackets, I’ll have to experiment when I get it! I l-o-v-e this. Grace is sooooo cute!! Absolutely! 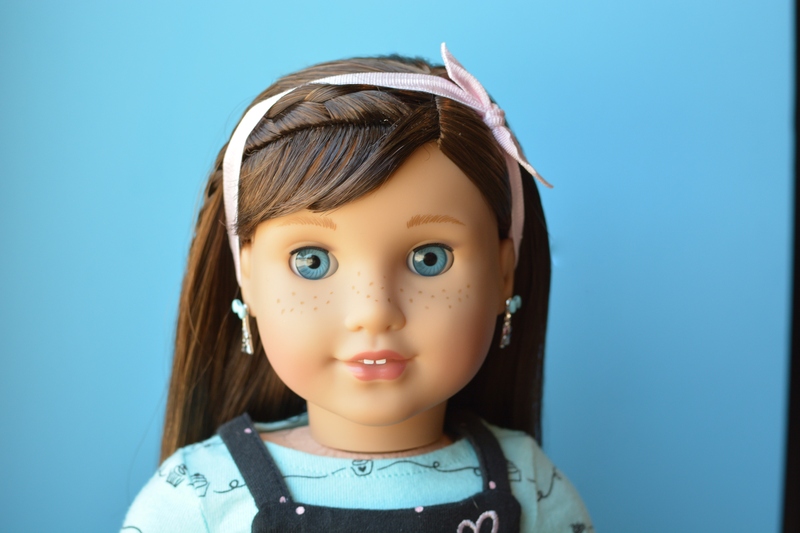 She is a great doll. Her hair is super easy to manage and she looks great in blue.